FILE - Chinese Vice Foreign Minister Liu Zhenmin. Chinese Vice Foreign Minister Liu Zhenmin said on Monday the disputed South China Sea should not be discussed at a meeting of the Association of Southeast Asian Nations (ASEAN). "It should not be discussed," said Liu. "This is not the right forum. This is a forum for promoting cooperation. If the U.S. raises the issue we shall of course object. We hope they will not." The issue was not on the official agenda, but expectations had been high that it would be discussed against a backdrop of increasing tensions and overlapping claims in the potentially energy-rich South China Sea. The United States, worried about China's increasing assertiveness in the region, is expected to repeat a call for Beijing to halt land reclamation on islands in disputed waters. Neither the United States nor China are members of ASEAN, but have been invited to participate alongside other countries outside the group. U.S. Secretary of State John Kerry will be in Kuala Lumpur on Wednesday and Thursday. A draft of the joint statement to be issued at the end of the ASEAN meeting, seen by Reuters, said leaders were concerned with recent developments "which have the potential to undermine peace, security and stability in the South China Sea." FILE - Philippine and U.S. troops prepare for a combined assault exercise at a beach facing one of the contested islands in the South China Sea known as the Scarborough Shoal in the West Philippine Sea, April 21, 2015. Speaking to reporters in Singapore, Chinese Foreign Minister Wang Yi dismissed a proposal to freeze provocative activities in "What to freeze? Every country has a different consideration," he said ahead of his visit to Malaysia. "What's the standard for freezing? Who is to judge the process of the freezing activity? These are very complex questions. So the freeze proposal may seem even-handed, but it's actually unrealistic and will not work in practice," said Wang. China has repeatedly urged Washington not to take sides in the escalating maritime dispute over the area, where it last year stepped up construction of artificial islands, provoking U.S. criticism and alarming neighbors. Last week, China accused the United States of "militarizing" the South China Sea by staging patrols and joint military drills there. 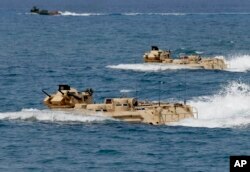 The United States has stepped up military drills with regional allies such as the Philippines. "Outside countries, they are trying to militarize the region," Liu told Reuters. With the disputed area becoming Asia's biggest potential military flashpoint, China and Southeast Asian nations have agreed to set up a foreign ministers' hotline to tackle emergencies in the South China Sea, a senior official of the ASEAN grouping said on Friday. Liu said the hotline was a "useful" mechanism but that no guidelines on it had been outlined so far. "You need rules for operation, so we are requesting an amended joint working group to formulate the guidelines," he said. Apart from the 10 Southeast Asian countries, the meetings will also see participation of China, Japan, South Korea, Australia, the United States, the European Union, Russia and India.